We had such a blast making last month's Scorpio astrological stitch poster and got a lot of positive feedback from ya'll, we decided to make it into a new series! Once a month for the next 12 months, we'll be putting up a poster for you to download and stitch along with some general facts about each astrological sign. Learn more about your sign and the 11 others with us! We geek out hard on all things astrology, so it's a total no-brainer that we want to share it with you. 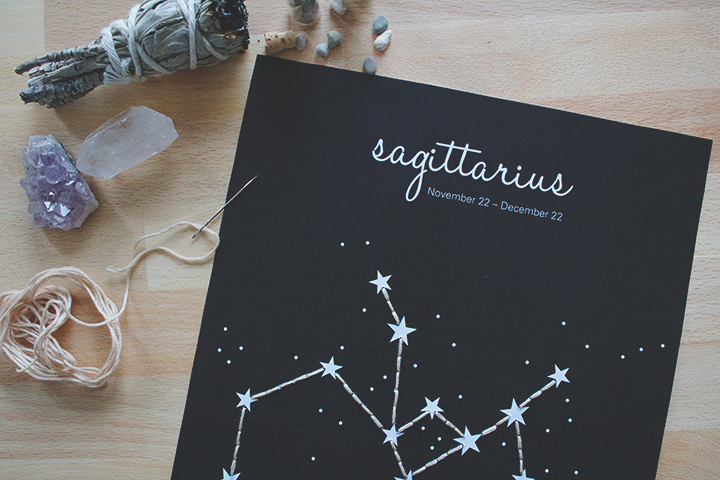 Today we're highlighting the ninth astrological sign Sagittarius. Ruling Planet: Jupiter. Jupiter is the planet of good fortune, optimism, expansion, and abundance. Written Symbol: The Archer. Symbolizes wisdom angled away from trouble and earthly concerns and pointing towards higher ideals. Birthstone: Turquoise. Attracts love, protects from harm, and gives its wearer the ability to see into the future. "Sagittarius is the sign of philosophy, higher learning, and broad concepts. It's natives are happiest discovering new ideas, exploring distant places, and not getting tied down with personal commitments. Sagittarius is energetic, ambitious, generous, freedom-loving, and a seeker of challenges, open to new ideas and exploration. You're motto is Tomorrow is another day. Even in your darkest moods, you believe there's a light shining around the corner. Your confidence in the future is genuine, but you hate everything interfering with your plans. You have a hunger to experience life at it's fullest - to travel, meet interesting people, and see things you've never seen before. Anything new sparks your interest. In fact, you'll usually say yes to a suggestion without weighing its merits simply because it lifts your spirits. And while you're not exactly a moody person, you are high-strung and can become irritable when you start to get bored."